The air handlers, also known as the air handling unit, help circulate fresh air throughout your facility, which can be a huge help to everyone inside when they need to feel more comfortable. Since warmer temperatures are becoming more consistent, it’s time to pay more attention to the commercial HVAC systems in your building. The air handlers, also known as the air handling unit, help circulate fresh air throughout your facility, which can be a huge help to everyone inside when they need to feel more comfortable. However, the units may not be running as smoothly as you expect. Here is more information about them. 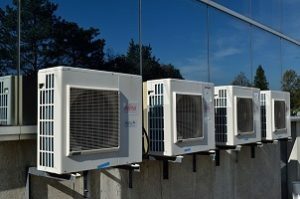 The smallest air handling units are known as terminal units and only include a few components. These parts are the filter, the blower, and the coil. There are also larger units that only work with the air coming into the building from outside. They are called makeup air units. There are also rooftop units that are mounted, as their name implies, on the rooftop of the commercial building that they serve. Once the air is conditioned, the air handler distributes it wherever it needs to go. Forced air furnaces expel warm air while the air conditioner moves air that is already cool. Without the right filters, commercial HVAC systems can’t reach their full potential. The same principle goes for air handling units. When the filters give out, the contaminants that they contain can flood into the system and leave behind massive amounts of damage, slowing down or disrupting the system’s normal operations entirely. Visual inspections can reveal the condition of the air filters, as can a technological solution: attaching pressure switches to the unit and hooking it up to a notification alarm that pops up on the building management software interface whenever a problem arises. In the unpredictable weather conditions of spring, it could be hot one day and chilly the next. That’s why proper heating and cooling levels are needed until summer is in full swing. Direct and indirect heat exchangers and secondary coils made of copper or aluminum are essential pieces of the puzzle when it comes to this process, so you are duty-bound to ensure that they are working as they should be. Crockett Facilities Services, Inc. (CFSI) is committed to helping building owners, property managers, engineers, and facility professionals lower their operating expenses through HVAC preventive maintenance. We can develop a cost-effective, customized preventive maintenance plan for your commercial building that will provide you with peace of mind, improved comfort, and energy savings. To learn more about the importance of HVAC Preventive Maintenance, please contact us at 202.600.2787 or mford@crockett-facilities.com. Our PM contract customers receive priority service with 24/7 emergency service in Maryland, Virginia and Washington, DC. Follow us on Facebook, Twitter, LinkedIn, and Pinterest! This entry was posted on Thursday, April 11th, 2019	at 10:34 am	and is filed under Commercial HVAC Systems . You can follow any responses to this entry through the RSS 2.0 feed. Both comments and pings are currently closed.